Having a new baby in the house means adding new baby toys. Of course I only want what is best as most parents. SmartNoggin is a company that believes baby's learning begins at birth. The company wants to help parents to lay a foundation for baby's future learning. They have developed 2 developmental toys to help infants to meet their milestones. 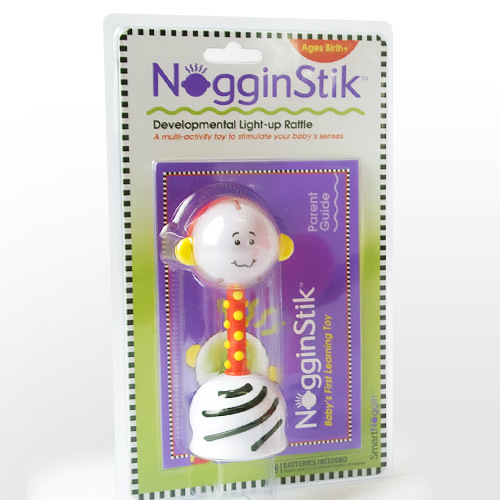 NogginStik Developmental Light Up Rattle is a multi-activity toy. The head lights up to see and follow with their eyes. The the light changes between red, green, and blue. It encourages visual tracking skills from birth. The light is activated by baby's hand. Baby is able to easily hold the handle to master their grasp. The handle is textured to help delight the sense of touch. It has a soft rattle sound that pleases the ear and works on hearing. The bottom of the rattle has a small mirror for baby to see. It is made with bold colors that catches babies eyes and interest. The NogginStik can be used during tummy time, playtime, and alone. It comes with a great chart to give ideas on how to use it with baby and what milestones are expected broken down by months from birth to 12 months. I really like all the functions of this one baby toy. The light up color is soft. It is easy for Madilyn to tap it for the light to come on. The handle is thin and easy for her to grab onto. It is light enough for her to move it around. So far she has not really discovered the mirror. She likes to put it in her mouth. I really like this toy and expect it will be something she will continue to play with for a while. 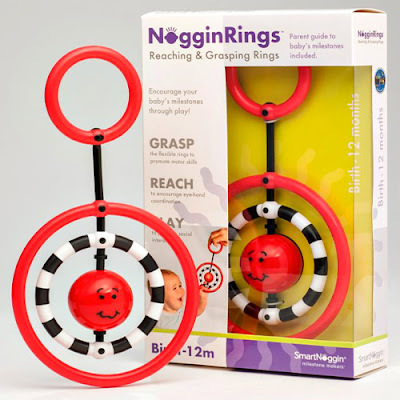 The NogginRings Grasping Rings is another SmartNoggin infant toy. It has high contrast colors of red, black, and white that will grab a newborns visual attention. You can hold it for baby to swat at, grasp, and hold while playing together. It has a soft rattle sound that will entertain and not startle baby. There is a face in the middle that makes for a fun peek a boo game. It encourages two hand play and exploration with older infants. This toy also encourages different sensory play. It bends and moves easily. While holding it out for Madilyn she would smile and swing her arms around. She could easily grasp this toy also. The colors seem to catch her interest. Both of these developmental toys are great for infants and up. Madilyn is reaching and playing with these. I look forward to seeing how she is learning and growing with these toys. Both of these toys earned spots on the Oppenheim's Very Best Infant Toy's for 2015 List. 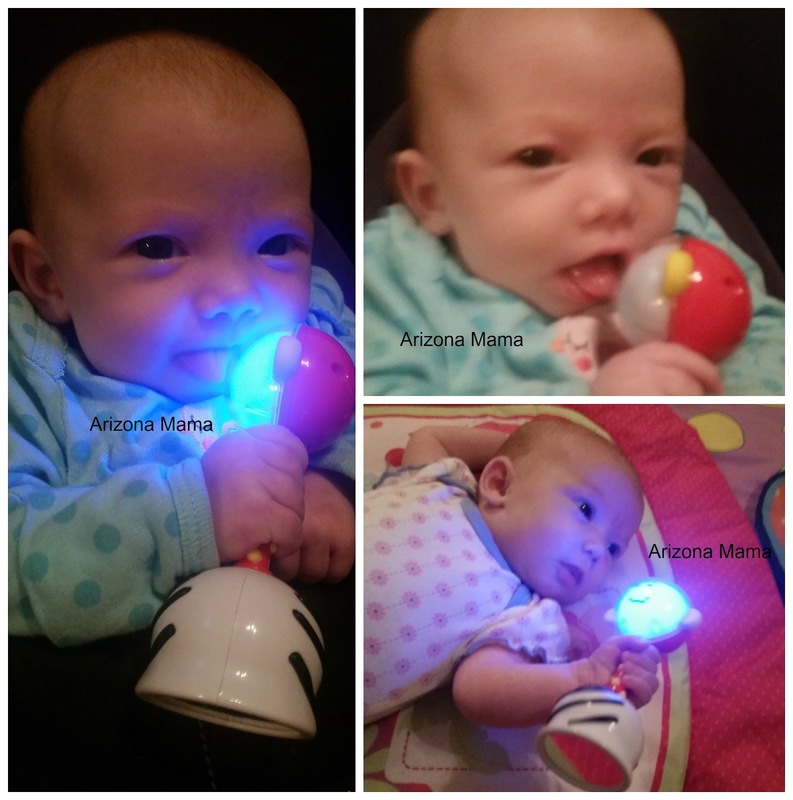 Win it: One (1) Arizona Mama reader will win a SmartNoggin NogginStik and NogginRings. Thank you to SmartNoggin for the review and giveaway!! I learned it lights up and can stick on surfaces. They got one of the 10 best toys award from Dr. Toys. I learned that research shows that the foundation for all future learning begins at birth. I learned that the head of the NogginStik lights up blue, red and green to stimulate your baby’s eyes & to encourage visual tracking! I love that it has texture and lights, which are great for learning.